Preheat oven to 350°F and grease 9×13 cake pan. Sift together sugar, flour, cocoa powder, baking powder, baking soda, and salt into a large bowl. Whisk together whole milk (or buttermilk), butter, whole egg, yolk, vanilla, and almond extract in another large bowl until just combined. Beat egg mixture into flour mixture with an electric mixer on low speed, then beat on high speed 1 minute. Reduce speed to low and beat in water until just combined (batter will be thin). Pour batter into cake pan and bake until a tester comes out clean, 35 to 40 minutes total. Do not overbake. Make frosting: Reduce oven temperature to 325°F. Spread coconut in a large shallow baking pan and pecans in another. 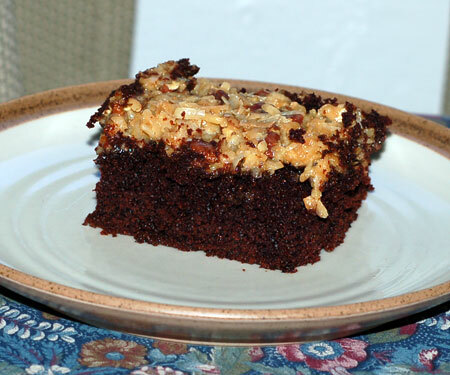 Bake pecans in upper third of oven and coconut in lower third, stirring occasionally, until golden, 12 to 18 minutes. Remove pans from oven. Increase oven temperature to 425°F. Pour condensed milk into a 9-inch deep-dish pie plate and cover tightly with foil. Bake milk in a water bath in middle of oven 45 minutes. Refill baking pan with water to reach halfway up pie plate and bake milk until thick and brown, about 45 minutes more. Remove pie plate from water bath, and stir in coconut, pecans, and vanilla. If too thick to spread, add a bit of cream until spreading consistency. Spread over cooled cake. Make optional glaze while milk is baking: Melt butter in a 3-quart saucepan; add cream and heat through without boiling. Remove pan from heat and add chocolate and corn syrup, whisking until chocolate is melted. Transfer glaze to a bowl, and chill, stirring occasionally, until thickened and spreadable, about 1 hour. Spread over coconut frosting. Cooks’ notes: Cake keeps, covered and chilled, 3 days. Bring to room temperature before serving. Update 2/4/09: I made this cake for Jeremy’s birthday again this year, and it was just as good as we remembered it. Having noted a bit of dryness in the cake last time, this year I made up some vanilla-scented simple syrup and brushed that over the cake while toasting up the nuts and coconut for the frosting. I’m not entirely sure about the texture of this frosting, though: it tastes right, but stiffens up almost into a candy, so it isn’t the easiest to eat with fluffy cake. I may look for an alternative next time.